Today I'm going to review one of the most amazing possession of mine. It's a Brow Expert Kit which was sent to me by Sigma as a welcome Gift in "Affiliate Program". I have not reviewed it before but if you are following me on Instagram you would be knowing I use it in my eye makeup look. The Brow Expert Kit contains a collection of seven fundamental tools and tints needed to arch, shape and groom the brows. 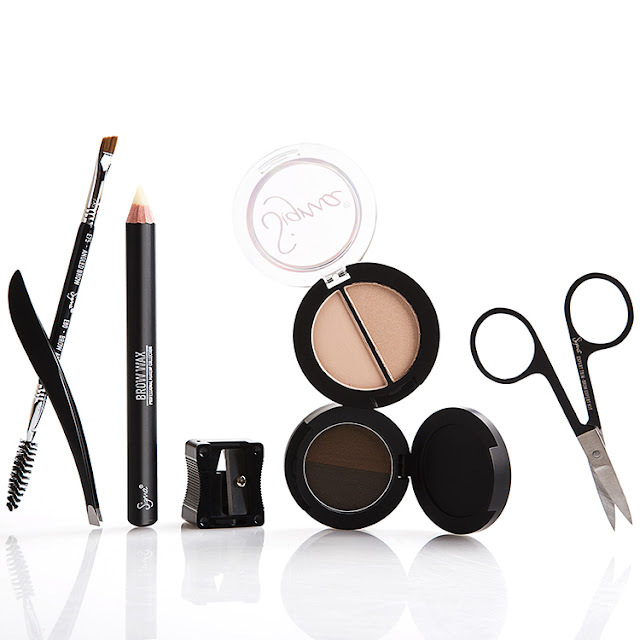 Add this kit to your essential beauty routine to completely enhance your overall makeup look. I got it in shade "Medium" which is perfect for my asian skin complexion. It doesnot give me artificial look and my brows look so real and perfect. The angled brow & E80 ensures smooth and flawless application of the product and makes it effortless to define brows. The sharperner is the most useful of all as I was actually looking for a Sharpener to sharp fat pencils. I love this Brow Wax Pencil because it feels very light and unlike wax pencil they are not heavy or greasy . The kit also comes with a highlighter Duo Like eyebrow finishing cant be complete with out highlight. It contains both a matte and a shimmery shade. This is a perfect kit for any one and I am totally in love with this kit- I didn’t realize how much I neglected my brows until I went through all the steps! This 7-piece kit contains everything you need to shape, groom, maintain and makeup on a daily basis. It’s a perfect for traveling as it will easily fit in any bag. The quality is incredible, and I definitely think it’s one of Sigma’s finest products.It's Suitable for all skin type as well. This looks like a useful kit! Congratulations for your affiliation with sigma...May you get more success in your life. Post was amazing. Love the kit as It contains all the eye make up essentials. I have it in dark and i love it. Looks such a useful product, but i'm not sure I would be the right person to use it. Wow! I love all the products! So good~~~ Thanks for the great review! It looks like a very good product. Thanks for sharing. Such a lovely product it is! the kit looks amazing! i'm sure you're gonna use it a lot! I have he same kit and it is amazing! It is great that you get everything you should need! love all the sigma collections. This brow kit looks quite nice thanks for the review. Great kit. I need one like this right now. I just wish it's available near my area. this eyebrow kit is so useful and all tools are products are really nice,thanks for sharing. never knew there are so many things required to shape our eyebrows properly. thank you for the post! I love each and everything in this kit. it looks like a great kit and it would make a wonderful gift. What a great little eyebrow kit! This is a great gift, you're very lucky! I'd love this. My eyebrows are my babies haha. I take care of them more than anything else and I love a good eyebrow kit. I love everything by sigma. they are amazing! havent tried this brow kit though. ohh i love to see how it work on your brows though..wish to try sigma brand soon!